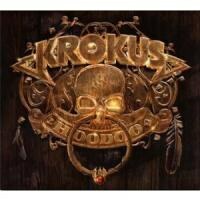 Krokus falls into the common trap of homage, falling so deeply into imitation as to approach self-parody. Is Hoodoo the best album AC/DC never recorded? Even if that question did make any sense, it'd be up for debate. First, though, some history: Krokus is a Swiss rock/metal band active since the mid-'70s that had its greatest success in the early '80s with a lineup almost completely different than the one it started with. Since that time, Krokus has been more or less active despite more roster moves than you could count on your fingers and your toes, but now they're back to the same group of guys that featured on those '80s successes. Also, they're signed to Sony, presumably for the sake of cornering the market on AC/DC and bands that sound just like AC/DC. While there is certainly a niche for this kind of stuff, it's surprising that such an obvious imitator -- despite the longevity of the band name -- would pull in a major label contract, but here it is. Krokus falls into the common trap of homage, falling so deeply into imitation as to approach self-parody. Covering "Born to Be Wild" is just a bad idea at this point, because it can't help but sound self-conscious and calculated, and the epic balladry of a song like "Ride Into the Sun" exposes the vocal limitations of otherwise capable Bon Scott imitator Marc Storace. That said, Krokus pulls off balls-to-the-wall just fine, as songs like opener "Drive It In" and deep cut "Keep Me Rolling" don't stop to think long enough to shoot themselves in the foot. Besides, once "Hoodoo Woman" gets stuck in your head, you might not be proud of yourself, but at least you'll be able to acknowledge that Hoodoo isn't necessarily as awful as it seems.